I have been seeing these all over the place online lately - my favorite blogs, pinterest, food and recipe sites... So I decided I needed to give them a try. 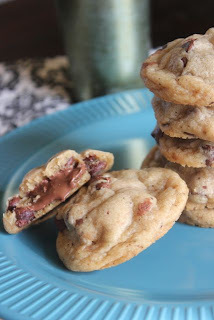 I was sure that I would like them... no doubt about that - I love chocolate chip cookies and I sometimes just eat a big ole spoon of Nutella (oops my secret is out). 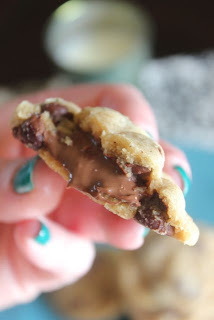 These cookies are just do luscious, so decadent, so perfect.... make them right away. I promise you won't be sorry. I promise the extra steps will be worth it. First, place the Nutella in a pastry bag or a ziplock bag with about a 1/2 inch hole cut in one corner. Squeeze dollops of Nutella onto a piece of waxed paper or parchment paper, place on a flat plate or baking sheet, and freeze for an hour or two. This is really an essential step. 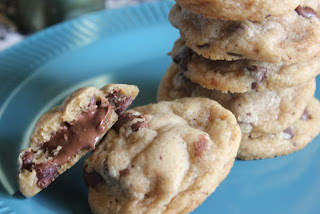 If you skip this, it will be very, very messy to fill the cookies with the Nutella. To brown the butter, place the butter in a small heavy saucepan over medium heat. Melt the butter and continue cooking until a light brown (about 5 minutes). Remove from heat and allow the butter to cool. In a large bowl, blend together the flour, baking soda, cornstarch, and salt. In a separate large bowl, use an electric or stand mixer to cream together the cooled butter and sugars. Add the egg and egg yolk, vanilla, and yogurt and mix to blend. Slowly add the dry ingredients and mix until just combined. Fold in the chocolate chips. Refrigerate the dough for about 30 minutes. Using a small cookie scoop if you have it, spoon out about 2 tablespoons worth of dough and form into a ball. Place on a baking sheet lined with parchment paper or a silicon baking mat. Create an indentation in the dough and place one of the frozen Nutella dollops in the center. Form the dough around the Nutella to seal it in. Repeat with the remaining dough and Nutella dollops, spacing each ball of dough about 2 inches apart on the baking sheet. Bake cookies for 8 to 10 minutes (don't overbake). Remove from oven (optional: sprinkle on some course sea salt for extra luscious flavor if you like) and allow to cool for a few minutes on the baking sheet, then transfer to a wire rack to cool completely.